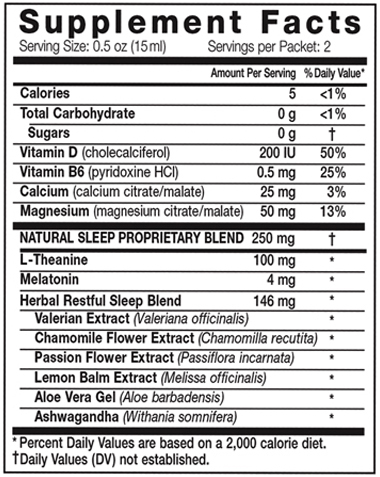 This unique combination of nutrients provides a safe, natural and effective formula for healthy sleep. * It helps you move into a state of relaxation as you prepare to retire for the night, and then helps you easily fall asleep. It supports your body in achieving deep and restorative rest, but won’t leave you feeling groggy when you wake up. • The 1.7 ounce single serve packets are ideal for traveling, vacationing, or even just having next to your bedside table. Contributors to poor sleep are many: Stress, work, poor diet, too much caffeine, alcohol and nicotine, to name a few. Managing our choices is the easiest way to help support our health. And while there are many over-the-counter and prescription medications that can help individuals get more sleep, many of these drugs can be addictive, and only work through sedation, not by supporting the natural sleep cycle. 8 in 10 people have some form of challenge with sleep. Experience restful sleep tonight with Eniva Natural Sleep – the very finest in nutraceutical innovation for providing natural sleep support ingredients in liquid form. Other Ingredients: Purified water, citric acid, malic acid, natural flavors, sorbic and/or benzoic acid(s) [protects freshness], xanthan and/or guar gum, stevia leaf extract. Directions: Adults: 1/2 to 1 packet 30 minutes before bed. Timing: Take 30 minutes before bed. Dosing: Take 1 ounce (2 servings on first night). Then, adjust between 1-2 servings per night as needed. Recommendations: Allow 6-8 hours for sleep. May combine with 8 ounces of water / juice. Caution: Do not use this product while driving, operating machinery, or with excessive alcohol intake. Do not consume if tamper resistant seal is broken/missing. Do not consume if allergic to any components found within product. As with all dietary supplements, contact your doctor before use. If taking prescription medications, have an ongoing medical condition, are pregnant, nursing or under age 18, consult doctor before use. Isolated minerals or nutrients are best taken as part of a well balanced diet and broad supplement program. KEEP TIGHTLY CLOSED. KEEP OUT OF REACH OF CHILDREN. Sleep tight works! It has provided me with the best night sleep I’ve had in years, without grogginess in the morning.